The limited edition Skoda Rapid Monte Carlo, which was first launched in August 2017 and later renamed to Skoda Rapid Edition X, has been re-introduced in the country. The special version of Skoda India's C2-segmenter has gone on sale for a base price of INR 11.16 lakh*. The new Skoda Rapid Monte Carlo features a handful of exterior and interior enhancements that help it enjoy a distinct identity. Highlights of the exterior include a black radiator grille, R16 dual-tone alloy wheels, gloss-black ORVM caps, black tailgate lip spoiler, black roof wrap, and quartz-cut projector headlights with chrome eyelashes and LED DRLs. While the original 2017 Rapid Monte Carlo was available in Candy White and Flash Red colours, the new version is available exclusively in the latter. Inside, the new Skoda Rapid Monte Carlo has a piano black trim, contrasting red stitching on steering wheel and gear knob covers, steel foot pedals, leather-wrapped flat-bottom steering wheel, Monte Carlo design door sill plates, Monte Carlo design leatherette upholstery and Monte Carlo design cushion pillows. Equipment highlights include rain-sensing wipers, AmberGlow footwell illumination, cooled glovebox, rear parking camera and Drive Audio Player touchscreen infotainment unit with SmartLink smartphone connectivity option. Mechanically, the Skoda Rapid Monte Carlo has no differences from the standard variant. Powering the petrol engine model is a 1.6-litre MPI motor that outputs 105 PS and 153 Nm. Transmission options include a 5-speed manual and a 6-speed Tiptronic automatic unit. The oil-burner on offer displaces 1.5-litre and produces 110 PS and 250 Nm. It can be paired with either a 5-speed manual or a 7-speed DSG automatic transmission. 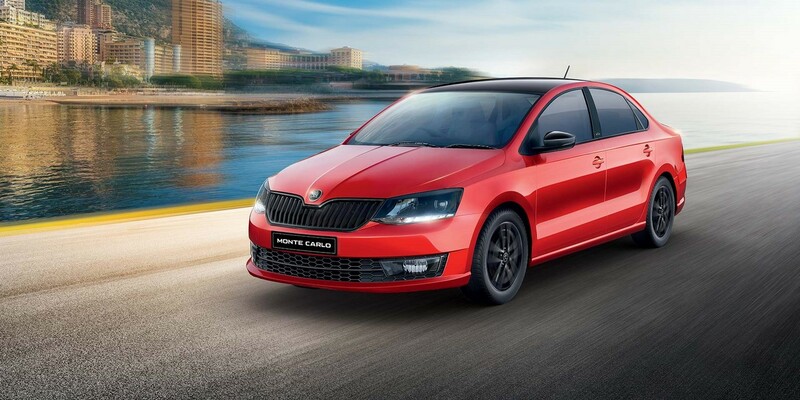 The Skoda Rapid Monte Carlo edition pays homage to its manufacturer's motorsport heritage. It features several exterior and interior styling enhancements for a bolder look.